Director – Peter Jackson, Screenplay – Peter Jackson, Philippa Boyens, Stephen Sinclair & Frances Walsh, Based on the Novel by J.R.R. Tolkien, Producers – Peter Jackson, Frances Walsh & Barrie M. Osborne, Photography – Andrew Lesnie, Music – Howard Shore, Visual/Creature/Makeup Effects – WETA Workshop Inc (Creature Effects Supervisor – Richard Taylor, Visual Effects Supervisor – Jim Rygiel), Special Effects Supervisor – Mark O. Forker, Production Design – Grant Major. Production Company – New Line Cinema/Wingnut Films. Frodo Baggins and Samwise Gamgee continue on towards Mount Doom in Mordor. They discover the pathetic Gollum, the former owner of the Ring, following them and he agrees to guide them, although they are unsure whether he can be trusted. At the same time, Frodo struggles against the influence the Ring is having on him. Meanwhile, the other hobbits, Merry Brandybuck and Pippin Took, escape capture by Saruman’s Uruk-Hai and flee into Fangorn Forest where they are found by the giant tree people the Ents. 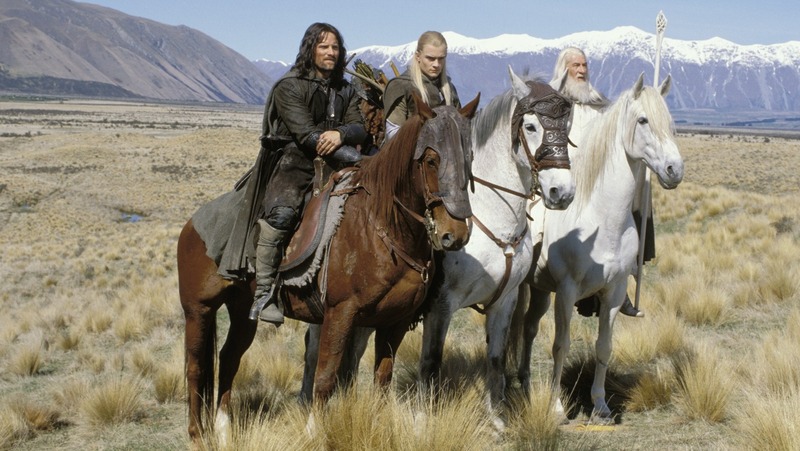 As they pursue Merry and Pippin, the remaining members of the Fellowship, Aragorn, Gimli and Legolas, find Gandalf alive. They travel to Rohan where Gandalf frees the aging King Theoden from the poison influence of Saruman’s agent Grima Wormtongue. As the orcs ravage the lands, Theoden moves his people to safety at the great fortress of Helm’s Deep. However, Saruman has raised an army of 10,000 and marches on Helm’s Deep. With only three hundred to defend against the horde, Aragorn, Gimli and Legolas throw their weight in with a battle to save mankind that is doomed to almost certain failure. The Lord of the Rings: The Two Towers is of course the second in Peter Jackson’s trilogy of Lord of the Rings films that began so successfully with the worldwide hit of The Lord of the Rings: The Fellowship of the Ring (2001). It is wrong to regard The Lord of the Rings: The Two Towers as any traditional sequel – J.R.R. Tolkien wrote The Lord of the Rings as one work and it was only split into three books by his publishers Allen & Unwin, while Peter Jackson has shot all three films as one saga. That in mind, The Two Towers certainly does what any good sequel should – indeed does what most sequels rarely ever do – it complexifies and expands the first story out onto a much wider scale. The first film, The Lord of the Rings: The Fellowship of the Ring, was principally concerned with introducing us to the world of Middle-Earth and its denizens and creating the quest. By contrast, The Lord of the Rings: The Two Towers spreads the story out across the land, splits the party up and tells three disparate strands of story – Frodo, Sam meeting Gollum; Merry and Pippin meeting The Ents; and Aragorn, Gimli and Legolas and the battle for Helm’s Deep. It is something that gives the scale of the story a breathtaking sweep, culminating in a massive battle scene. If nothing else, The Two Towers ups The Fellowship of the Ring in terms of the sheer scale that the story is being conducted on. Certainly, the very faithfulness to the J.R.R. Tolkien text does leave The Two Towers with a few problems in terms of a story. One of these is that the story almost entirely sidelines the two central characters fromThe Fellowship of the Ring. Frodo is pushed to the backburner as a character – of the three strands of story being told, his is the slightest and even when he is around, he tends to be upstaged by the wonderfully bizarre creation of the Gollum. It is the same with Ian McKellen’s magisterial performance as Gandalf that anchored the first film – his salvation from the Balrog and resurrection is dealt with at the start of this film, but after that he vanishes off-screen until a couple of scenes near the very end. Even the principal nemesis of Christopher Lee’s Saruman is barely seen throughout, with only a handful of brief scenes showing him strutting through the mines of Isengard with malevolent intent, presumably to remind audiences he is still there. On the other hand, The Two Towers brings in many new story elements and characters. The Rohan and Gondor sequences give welcome screen presence to Australian actors such as Miranda Otto and the up-and-coming David Wenham, whose Faramir remains perhaps a little too mellow. Elsewhere B movie (over)-actor Brad Dourif makes a wonderfully slimy Grima Wormtongue, while Bernard Hill rises with crusty strength to fill the role of King Theoden. Most of all, the existing characters get much more of a workout. The magnificently dark and brooding Viggo Mortensen starts to come into his own. All the supporting characters from the Fellowship start to mature as characters – especially Merry and Pippin who were played for comedy in the first film and are treated more seriously this time around. John Rhys-Davies becomes a considerable comic scene-stealer as Gimli, while Sean Astin, somewhat colourless in the first film, emerges with appreciable strength as the dutiful and loyal Sam that we all know on the page. On the minus side, there is an unnecessary return of Liv Tyler’s Arwen – a non-character in the books who reappears to give depth in flashback to the romantic scenes between her and Aragorn and explain the elves departure from the world. (This was almost certainly part of the extensive reshoot scenes that Peter Jackson conducted throughout 2002 and was presumably added to flesh out the popularity of the romance with audiences). The great artistry that Peter Jackson offers is that he makes epic-scale fantasy cinema on the kind of scale that nobody has before. The nearest that anybody has come to doing what Jackson does here is George Lucas’s Star Wars saga – but even Lucas’s second trilogy tapered off into little more than a show being put on by Industrial Light and Magic and the merchandising tie-in people. Peter Jackson emphasises the things that George Lucas seems to have forgotten – a complex heroic arc with valiant heroes taking on vast forces in absolute black-and-white terms; a dense textural depth and background in the three-dimensional creation of an imaginary world and its people; a wondrous sense of awe; and just the right balance of humour and romance. Moreover, Peter Jackson puts special effects at the service of story. The Fellowship of the Ring revealed Jackson’s tendency to substitute special effects for characterisation, but he seems to have trimmed that here. (There is still the minor tendency to allow special effects to substitute for actors – instead of showing us Arwen’s sorrow at loving a mortal Aragorn, Jackson gives us nifty but pointless effects scenes of him aged and dying while she drifts like a ghostly wisp in black). In Star Wars Episode II: Attack of the Clones (2002), George Lucas offered up extensive effects sequences with massive Jedi battles and flying car races through packed skies, but in the end the film seemed like a novel piece of eye candy that one could hardly even remember eight months after the event when one came to sit down to watch The Lord of the Rings: The Two Towers. The Two Towers comes at an equivalent level of technical proficiency and detail and, by comparison, the results are breathtaking. The set-piece of the film is the fabulous battle of Helm’s Deep with the massed armies of 10,000 battering up against the walls, colossal explosive detonations and the awe-swelling climactic image of Gandalf leading an army of Rohan Riders down a hill in a burst of sunlight. 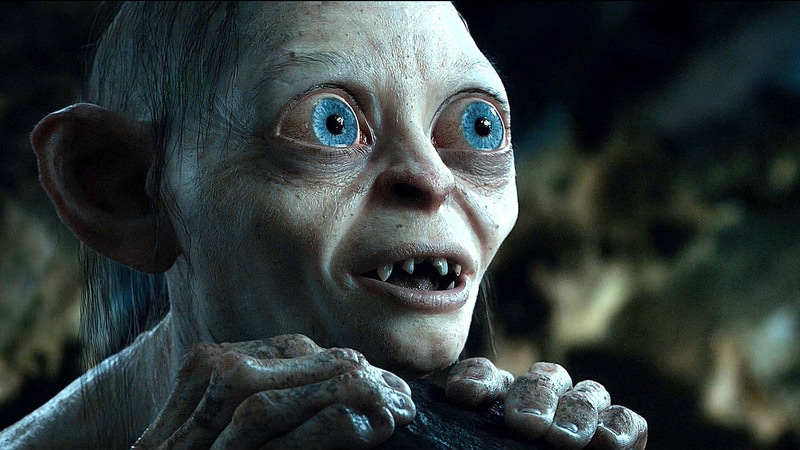 On a less expansive level, there is the impressive aforementioned Gollum who is rendered with amazing detail both of skin texture and nuances of character – the fact that the character is required to carry on split-personalitied conversations with himself makes one realize the complexity of character the WETA people are carrying off. The only aspect that does not work so well is the Ents who tend to look like cartoon characters, although the flooding of Isengard is another enthralling set-piece. George Lucas seems to have retrogressed and lost the art of harnessing effects to the telling of a story and appears to just throw them in for their own sake; in films like Heavenly Creatures (1994) and The Frighteners (1996), Peter Jackson seemed to be at that point a few years ago but has matured considerably here. What he creates here is a fusion of special effects wonderment, character and story into a single epic vision that should be an object lesson to all wannabe CGI directors. The next instalment in the series was The Lord of the Rings: The Return of the King (2003). Jackson subsequently returned to Middle-Earth with The Hobbit: An Unexpected Journey (2012), The Hobbit: The Desolation of Smaug (2013) and The Hobbit: The Battle of the Five Armies (2014). Peter Jackson’s other films include:- the zero-budget splatter film Bad Taste (1988); the hilariously adult take on the Muppets Meet the Feebles (1990); the gore-drenched zombie comedy Braindead/Deadalive (1992); Heavenly Creatures (1994), based on a sensational true-life murder in 1950s New Zealand; the flop ghost comedy The Frighteners (1996); and the afterlife film The Lovely Bones (2009). Jackson has also produced District 9 (2009), The Adventures of Tintin (2011) and written/produced Mortal Engines (2018). (Winner in this site’s Top 10 Films of 2002 list. Winner for Best Actor (Viggo Mortensen), Best Musical Score and Best Special Effects, Nominee for Best Director (Peter Jackson), Best Adapted Screenplay, Best Makeup Effects, Best Production Design at this site’s Best of 2002 Awards. No. 2 on the SF, Horror & Fantasy Box-Office Top 10 of 2002 list).